We implement financial strategies for our clients that focus on steady growth, wealth building and safety aspects that ensure you are meeting your fiscal goals and responsibilities. We meet with our clients annually and as needed to discuss any changes that need to be made to their financial strategy to ensure they remain on track with their goals. We take into account various life events including but not limited to marriage, birth of a child, graduation and college funding, wedding planning for your children, major purchases including your home, illness of yourself or a loved one, death of a family member, care of aging parents, and retirement options for you. When you contact us to ask about your investment options, we will appoint you your own committed independent financial adviser. Your initial consultation and all meetings with them will be free of charge and without obligation. Take a look at the chart below to see how some of our plans stack up with the stock market and how you can make so much more money with tax advantages as well. The chart shows you how much you can have with $100,000 in the stock market vs how much you could have had in one of our plans. 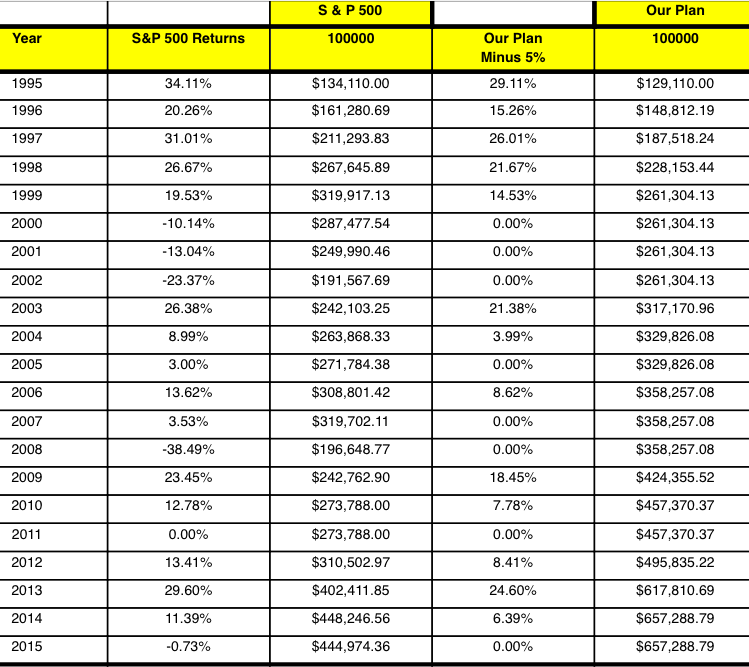 Our plan would have also been without taxes while the s&p 500 would have had tax ramifications. Contact us and we can show you many opportunities in this current economic environment.